Stop in Saturday April 27 10am -1pm to have your soil tested by URI Master Gardeners. The proper soil conditions is essential for a healthy garden. If the PH is too acidic or too alkaline (not typical in our area) plants cannot create a healthy root system to support a strong and abundant harvest.Master Gardeners will be on our hand to help give advice to amend your soil if necessary. In addition our family will be ready to help with your garden needs and answer questions to help get your garden ready for the planting season ahead. The animals are always to see visitors, but please note the animals area is open 10-3:30 daily and the fee is $1.00 per person which includes feed. In case you didn't get your fall garlic planted we do have Spring Garlic available. 1. Prepare your garden bed: Select a gardening area that receives 6-8 hours of sunlight per day. Wait until the soil has thawed and drained. To test, form a handful of soil into a ball, and then tap it with your fingers. If it crumbles apart easily, it’s time to plant. If it holds firm, wait a while longer for the soil to dry out more. Remove weeds, add some finished compost, and fertilize with an organic fertilizer. 2. Plot out your planting holes: Since the bulbs are expected to be small, you can plant them closer together. Plot out spring garlic planting holes about 2-4 inches apart, and about 2-inches deep. 3. Separate the cloves right before planting: Separate the cloves from the bulb. Use the largest and healthiest looking cloves for planting. Save the smaller and damaged cloves for cooking. 4. Plant the garlic cloves: Place the cloves in your prepare holes with the flat, root side facing down and the pointed end facing up. Cover, firm the soil, and water well. 5. Add mulch to your garlic bed: Cover the garlic bed with a 2-3 inch layer of organic mulch, such as straw or shredded leaves. This will help keep weeds down. Pezza Farm is celebrating over 70 years of family owned and operated. Our Farm was purchased in 1947 by my Grandfather when my dad was 5 years old. The farm has gone through many changes over the years, adapting in the process. Needless to say, we are grateful to our customers for giving us the opportunity to do what we love, and keeping the importance of loving the land in the family. Where did the animals go?? The Animal Area is closed until we reopen in March. The fee is $1.00 per person. which includes animal feed. We have new additions to our animal menagerie, Eye-ore and Barney the donkeys have joined the farm family as have 2 new baby calf's so far, with more to come. If you drive in you may notice something a bit different and many of our customers are asking the same question, " Where did the animals go?" . For the safety of our customers and for the well being of our animals we moved the animals to the back part of the greenhouse, it has been a long time coming. Too may people were feeding them items that were making them ill & chasing the chickens. Our animals now have the opportunity to graze in our fields and not be locked up in pens. We still offer food to feed them, and you may still visit them. However if you do not wish to feed them do not go up to the pens, this is not fair to the animals since they will be expecting a treat and may nip when you reach your hand out. We have goats, chickens, turkeys, Pokey the pony and the miniature horses, Lily & Cheyenne to visit. Our Straw that we sell is dual purpose, is also known as garden straw. It makes a perfect decoration, but unlike hay or other straw this can be used at the end of the season to cover your perennials & shrubs for winter protection or throw it in your veggie garden to make a fantastic compost and place a layer of newspaper down with the straw on top making it a natural weed barrier. This being that the wheat and seeds have already been harvested from it so it will not have the seed in it like the other type promoting troublesome weeds and rye in your garden. In our 13 greenhouses we try to grow a large assortment of vegetable, herbs, and other edible plants. We start our seeds using GMO free seeds in our own dirt mix to ensure that there are no chemicals, using only all natural products. Different plants have different needs, such as acidity levels and soil density and we make our mix batch by batch depending on what is being seeded in or transplanted that day. 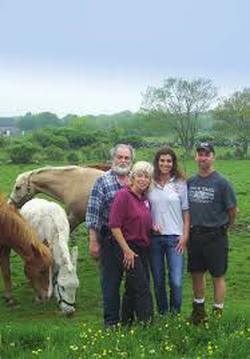 Pezza Farm has been family owned, operated and maintained by us, the Pezza's since 1947. We love what we do, and are grateful that we have been able to do so. We truly believe in the importance of taking care of the land. This is our life, our livelihood and do not want to do anything to jeopardize that, in addition if we take care of it in return the land will take care of us. Using natural chemicals is something we also believe in, we grow what we eat and always want to offer a quality product to our customers.